Luksusowy przeciwzmarszczkowy krem pod oczy idealnie pielęgnuje delikatną skórę wokół oczu. Unikalna formuła: złoto 24k, MATRIXYL®synthe'6® , olejek awokado i arganowy, D-panthenol, hydrolizowane proteiny pszenicy i masło Shea, zapewnia kompleksowe działanie. Intensywnie i długotrwale nawilża skórę, co poprawia jej jędrność i elastyczność. Pobudza syntezę kolagenu, redukuje zmarszczki i bruzdy. Przyspiesza naturalną regenerację naskórka, łagodzi podrażnienia i zapobiega nowym. Regularne stosowanie sprawia, że spojrzenie odzyskuje młodzieńczy blask i świeżość. Skóra staje się miękka, wygładzona, a kurze łapki i zmarszczki wyraźnie zredukowane. Codziennie rano i wieczorem krem delikatnie wmasować w skórę wokół oczu. 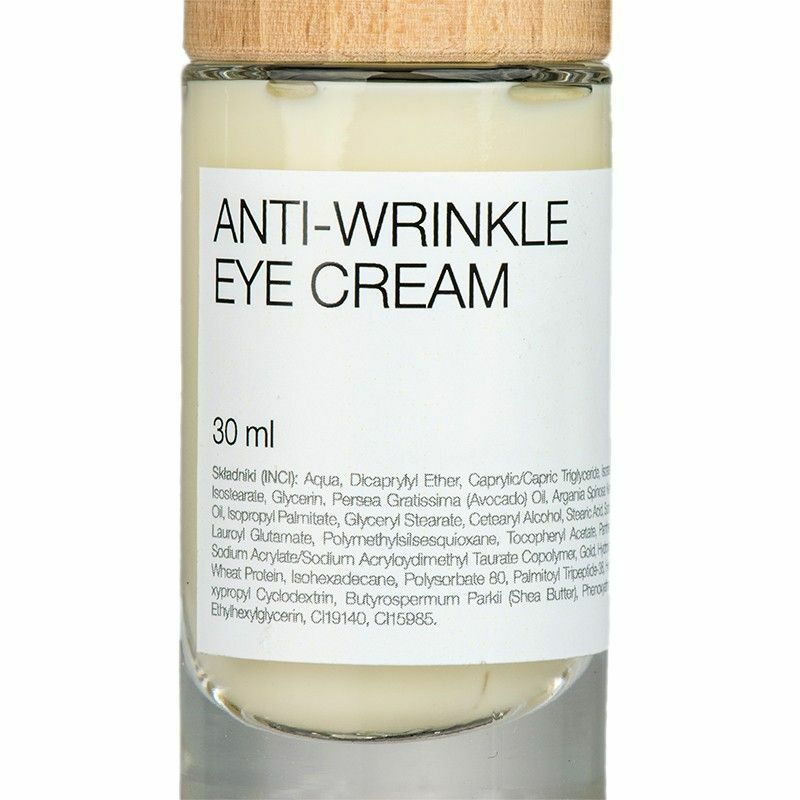 The luxurious anti-wrinkle cream provides perfect care to the sensitive eye area. The unique formula which contains 24-carat gold, MATRIXYL®synthe'6® , avocado and argan oil, D-panthenol, hydrolyzed wheat proteins and Shea butter brings comprehensive benefits to your skin. It provides it with long and intense moisturization, which improves its firmness and elasticity. 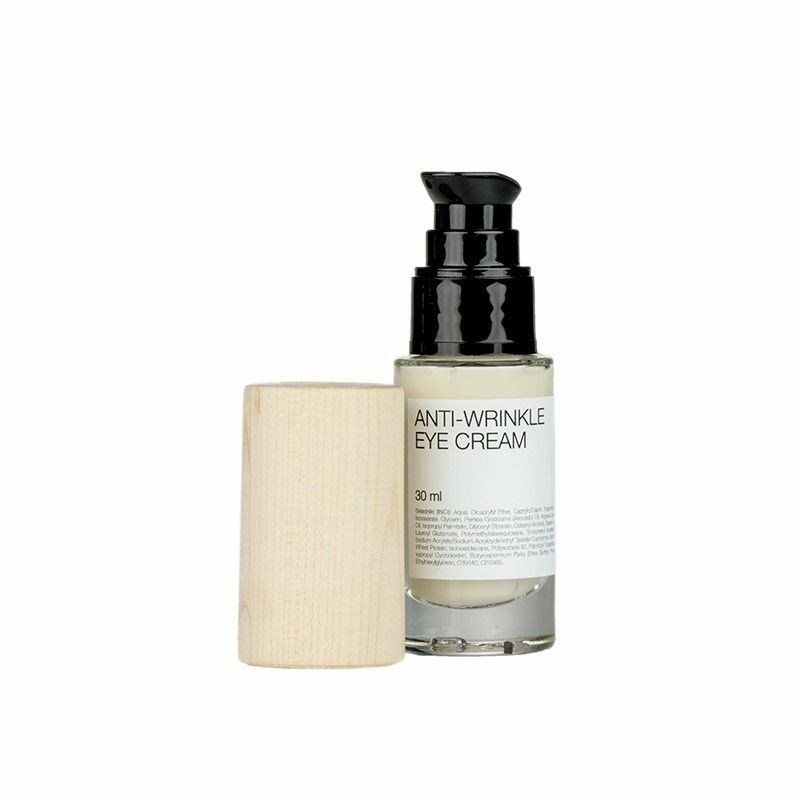 It stimulates collagen synthesis, reduces wrinkles and creases, accelerates natural regeneration of the epidermis, soothes and prevents irritation. Used regularly, it restores youthful glow and freshness to your eye area. Skin becomes soft, smooth, while the appearance of crow’s feet and wrinkles is visibly reduced. Ecological certificate for Shea butter, argan and avocado oil. Application: Every morning and evening gently pat the cream into the skin around your eyes. MATRIXYL®synthe'6® - anti-wrinkle peptides which fill wrinkles and creases from inside (especially crow’s feet) and stimulate the synthesis of collagen. Certified argan oil – revitalizes, hydrates, smoothens and firms skin, prevents any signs of premature ageing from appearing and enhances cell regeneration. It attenuates acne symptoms, smoothens scars and wrinkles and protects skin against UV radiation. D-panthenol – it protects the epidermis against water loss and effectively moisturizes skin which becomes soft and flexible. It soothes and regenerates it, and prevents irritation. 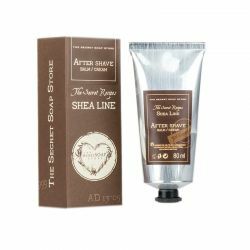 Shea butter - is highly valued for its skin smoothing and irritation treating properties. Soothes and smoothes the skin. Contains natural filters protecting against UVB radiation. Składniki (INCI): Aqua, Dicaprylyl Ether, Caprylic/Capric Triglyceride, Isostearyl Isostearate, Glycerin, Persea Gratissima (Avocado) Oil, Argania Spinosa Kernel Oil, Isopropyl Palmitate, Glyceryl Stearate, Cetearyl Alcohol, Stearic Acid, Sodium Lauroyl Glutamate, Polymethylsilsesquioxane, Tocopheryl Acetate, Panthenol, Sodium Acrylate/Sodium Acryloydimethyl Taurate Copolymer, Gold, Hydrolyzed Wheat Protein, Isohexadecane, Polysorbate 80, Palmitoyl Tripeptide-38, Hydroxypropyl Cyclodextrin, Butyrospermum Parkii (Shea Butter), Phenoxyethanol, Ethylhexylglycerin, CI19140, CI15985.